anybody knows if france will be here? BTW the kurganets seam to have very short guns. Why won't they show the ones with 45mm or 57mm guns ? Because there are no ready 45 or 57mm guns to show off. 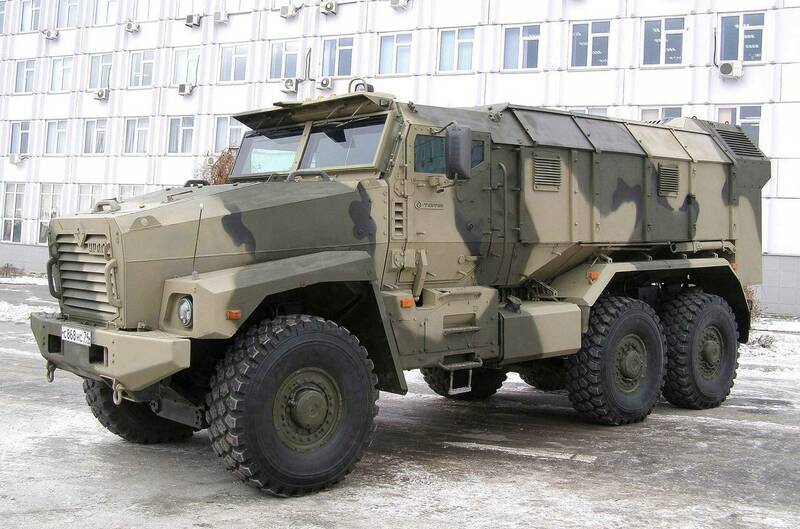 At the victory parade for the first time will be shown a new armored car "Тайфун-У"
Good. Nice to see something not from those Kamaz douchebags. TR1 wrote: Because there are no ready 45 or 57mm guns to show off. What about all the intensive testing of the 45mm autocannon shown on GurKhan since 2011? Do you have evidence of this "intensive testing"? Because I have not heard anything firm since GurKhan showed that pic. Dont you think it's idioticly pessimistic to expect absolutely no progress since then? I think it is foolish to assume progress is being made on something we are not even sure is being ordered/wanted by the military. GurKhan posts disinformation all the time. Someone can show me what's it's all about? Is it based on post WW2 45mm AA cartridge or WW2 (in fact 1930s) AT gun cartridge? It is a brand new design that was played with in the 1980s as a replacement for the 30 x 165mm shell in the Soviet Air Force, Army, and Navy. It has a telescopic case and would be a very modern powerful round. Rumour has it that the updated 57mm round of the S-60 AAG and ZSU-57-2 SPAAG won because of the larger capacity of the projectile for guided shells and other special newly developed rounds. BEIJING, March 26. /TASS/. Chinese servicemen will take part in the Victory Day parade in Moscow's Red Square, a spokesman for the Chinese Defense Ministry said on Thursday. "China will send guards of honor to participate in the military parade in Moscow on May 9," the spokesman said. Chinese leader Xi Jinping is expected to attend the Moscow celebrations of the 70th anniversary of the victory in the Great Patriotic War. HELSINKI, March 25. /TASS/. Finland's President Sauli Niinisto has no plans to attend the Moscow celebrations of the 70th anniversary of the victory in the Great Patriotic War on May 9, the Finnish Telegraph Bureau reported on Wednesday. The bureau quoted the president's office as saying that "the Ukrainian conflict and international situation" were the causes for Niinisto's refusal to take part in the celebrations. Russian Foreign Minister Sergey Lavrov said last week that 26 heads of state, including the leaders of India, South Africa, Mongolia, Vietnam. Cuba and North Korea, have already confirmed they will attend the celebrations in Moscow. "Invitations to the celebrations were sent to 68 heads of state, as well as the UN, UNESCO, Council of Europe and EU chiefs," Lavrov said. With western IFVs weighing about the same as a WWII T-34 tank (about 32 tons or more) the 30mm cannon of today just doesn't cut it in terms of reliably defeating enemy IFVS... which is a primary purpose of the main cannon on an IFV... defeat enemy IFVs, and carry missiles able to defeat tanks. that means a 57mm gun plus Kornet-EM missiles would be an ideal combination... the 57mm gun has enough HE fire power to replace the old 100mm rifled gun and rather more armour piercing power to defeat armour than the 30mm will ever have. It also offers the potential for laser beam riding 57mm HE rounds for use against aircraft and ground targets out to about 16km in the naval version. Note there is a naval 57mm equivalent but no current 45mm equivalent in service so new ammo could be developed for both weapons. This video is entitled 'BMP-3 is preparing to participate in the Victory Day parade'. If the model shown in the video is the same model as that being currently produced for the army (i.e. this is, what, the third iteration of BMP-3 orders for the army?) - then they've upgraded the 'base' Army model again. The gunner's sight has been upgraded with that of the BMP-3M (i.e. it finally has a thermal imaging channel), but contrary to the BMP-3M prototypes, the old lamp-style IR searchlight on the commander's cupola has been upgraded with the newer, PL-1 square laser searchlight that is prevalent on Russian vehicles nowadays (i.e. BTR-82A, upgraded BMD-2s, etc). We'll find out close to parade day, I guess. These BMP-3Ms are currently being produced for Azerbaijan, so not necessarily. GarryB wrote: It is a brand new design that was played with in the 1980s as a replacement for the 30 x 165mm shell in the Soviet Air Force, Army, and Navy. "45x386SR 45mm SM-20-ZIF1 and ZIF-68-1 anti aircraft gun"
"900m/s HE" claimed on tony williams' website. Pretty mean mofo of a round. But 57mm may be the right choice indeed. After all the 57mm is not even much bigger than the 45mm (case is even shorter)! so it would be possible to carry as much 57mm as 45mm, the choice is indeed obvious. I know, was a good gun, but the M1942 version was a fantastic gun, comparable in penetration to Pak 38 but lighter and with a reliable access to APCR ammo, still was used in korea and scored success against US tanks. As far as i know, M42 ammo was not compatible with earlier short 45mm guns, though the cartridge case was the same.